The Judgeship of West Champaran was constituted on 30.11.1976. The whole revenue District of West Champaran is the Jurisdiction of this Judgeship. Bettiah was Sub-Division of old Champaran District of Bihar in old Tirhut Division prior to it came into being in 1972 as a result of re-organization of the District in Bihar. West Champaran has been divided into two police District- Bettiah and Bagaha. Judicial history of West Champaran is very old.Upto 1906 West Champaran was under the jurisdiction of District and Sessions Judge, Saran with headquarters at Chapra. It was placed under the jurisdiction of District and Sessions judge, Muzaffarpur. In the year 1945, a separate judgeship of Champaran was established and Khan Bahadur Mohd Ebrahim was the first district and Sessions Judge, with headquarters at Motihari. District of West Champaran got its judgeship status on 30th, November, 1976 and Sri Ramesh Pathak was the first District and Sessions Judge. Sub-Divisional Court at Bagaha was inaugurated on 25th Feb 1982.On 27th April 1987 Sub Judge's court and on 23th April 2005, court of Additional District Judge was inaugurated at Bagaha. Sri JP Singh was first Additional District and Sessions Judge at Bagaha.There is new constuted Civil Court at Narkatiyaganj Sub-Division. The main building of the civil court was constructed in the year 1925 for the court of Munsif. 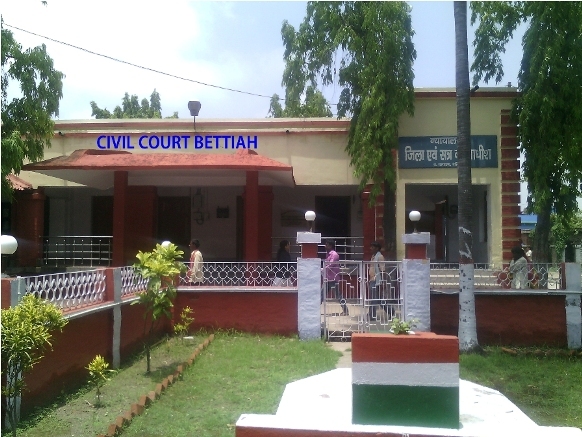 Presently the court of the District and Sessions Judge and the Court of the Principal Judge, Family Court, Bettiah have been accommodated in that building.